You have made it to the Southernmost Point in the Continental United States! The massive, brightly painted buoy that marks the Southernmost Point sits on land and is visited and photographed more than most buoys. It has the ability to attract people from around the world around the clock. Just watch. Even if you are thousands of miles away, you can experience being here with us. The Southernmost Webcam brings you the sunrises, sunsets, sunshine and storms. See the revelers, the trolleys, and the occasional rooster making a cameo. From this point at the corner of South and Whitehead Streets, there are a mere 90 miles to Cuba. Erected in 1983 by the City of Key West, the Southernmost Point buoy is a landmark and a must-see for any traveler to Key West. 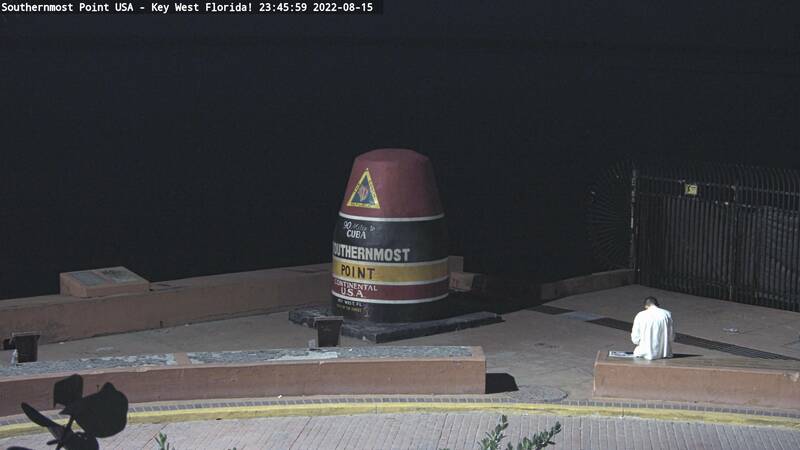 See it 24/7 with the Southernmost Webcam! If the webcam is not displaying, please click here. Copyright © Southernmost Webcam. All rights reserved. Internet marketing by Two Oceans Digital.